Prince Charles and Camilla's three-day visit to Nigeria is part of their nine-day tour of Africa. 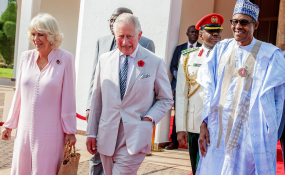 The PDP has welcomed Britain's Prince Charles to Nigeria and has urged him to caution President Muhammadu Buhari against rigging the 2019 general elections. The PDP also asked Prince Charles to caution Buhari against alleged continued violation of human rights, siege on democratic institutions, political intolerance and stifling of opposition and free speech in the country. The party, in a statement yesterday by its National Publicity Secretary, Kola Ologbondiyan, also called on Prince Charles to take President Buhari to task on his administration's "cavernous corruption disobedience to court orders, as well as its divisive proclivities, aloofness and insensitivity to the plight of Nigerians leading to escalation of violence and killings in various parts of our country in the last three and half years. "The PDP further urges the British Prince to counsel President Buhari not to attempt to rig the 2019 presidential election and be ready to accept his imminent defeat in the poll since it is clear that Nigerians have rejected him because of his incompetence and his administration's apparent disdain for their safety and well-being."